For most small boat applications the SonarVista software provides a complete solution that lets the user combine Depth, Position and Tide data to produce a processed final survey data set. 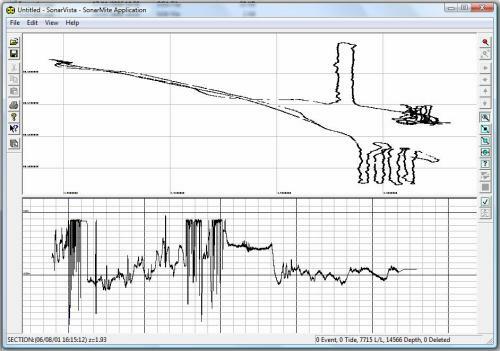 The software package is normally provided with the SonarMite echo sounder or the TidaLite tide gauge instruments as the download, editing and processing software. The program is designed for use on PCs running the Windows XP or Vista operating systems. SonarVista software enables the user to download directly from the instrument processor the stored data. On fetching the data, the program checks the time difference between the two processors to within 10ms, data can be time adjusted to bring the downloaded data into the same temporal frame as the position data already stored on the computer. 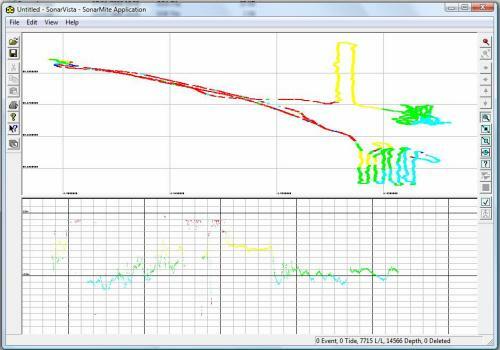 In addition to downloading data the SonarVista software can import position, depth and tide gauge data in a variety of different file formats. All data brought into the program is sorted by time and visually presented as a time series long section together with a plan view. Once the data is all present within the program the software can be used to edit the data, remove spikes and apply dimensional and temporal offsets independently to any of the main data elements of tide, depth and position. The software then interpolates intermediate values such as tide and position for depths, tide and depth for positions etc. When complete the user can export the processed data to a wide variety of datafile formats including ASCII, CSV, XYZ and 3D DXF for import to CAD packages.